Mr. Breedlove has been located and is safe. 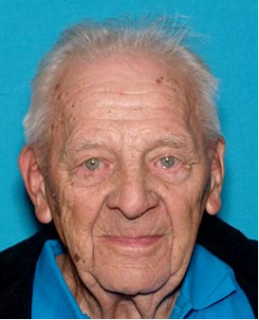 The Elk Grove Police Department is asking for the community’s help in locating an at-risk missing person, 90-year-old Roy Breedlove (photo above), who suffers from dementia. Mr. Breedlove left his residence in the 7000 block of McGill Court around 6 a.m. after a disagreement with his caretaker. Roy is described as a Caucasian male, 4'9", 110 lbs., with gray hair and green eyes. He was last seen wearing a white shirt with an emblem on the front, a colored t-shirt, maroon sweatpants and unknown colored shoes. Anyone with information regarding the whereabouts of Roy Breedlove is asked to contact the Elk Grove Police Department Dispatch Center at (916) 691-5246.